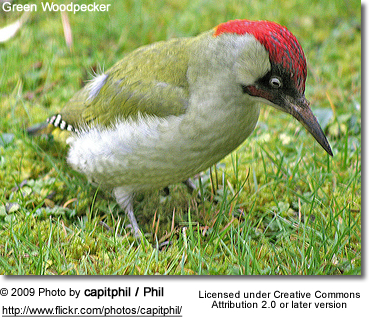 The Green Woodpecker (Picus viridis) is a member of the woodpecker family Picidae. 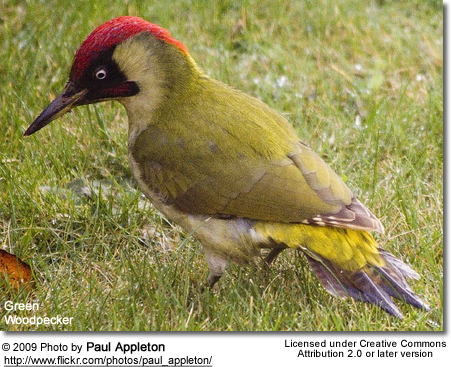 The Green Woodpecker is probably the best known, though not always the commonest of the European woodpecker species. It occurs in most parts of Europe, and in western Asia. The usual habitat is more open than those of the pied Dendrocopos species; it frequents old timbered parks, and any open country where there are ancient trees rather than dense woodlands. It's a large woodpecker, 30-36 cm in length with a 45-51 cm wingspan, conspicuous dress, loud call and habits render it more noticeable. 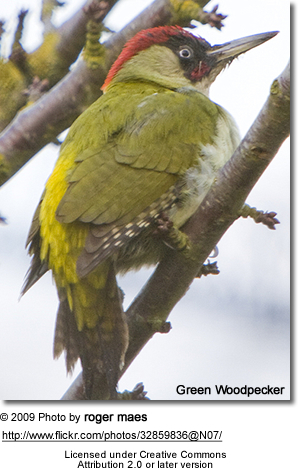 Though a very green bird, colour is not always distinct in the field, much depending upon the light. 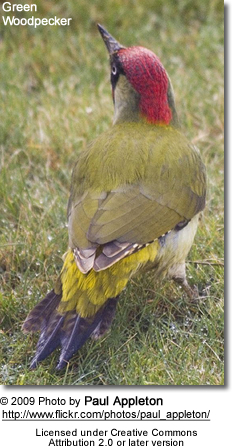 The plumage of the sexes is similar, dark green above and yellowish green below and with crown and nape crimson, but in the male the centre of the moustachial black stripe is crimson. The lores (the regions between the eyes and bill on the side of a bird's head) and around the eye is black in both male and female, except in the Iberian race P. v. subsp. sharpei which lacks this black area. 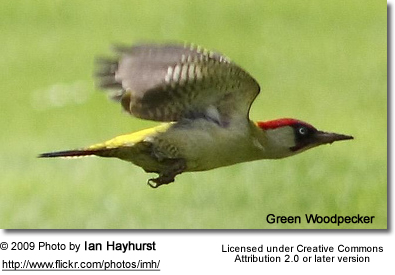 The rump is chrome yellow, the outer webs of the primaries (longest wing feathers) are barred black and white. The bill and feet are slate grey. 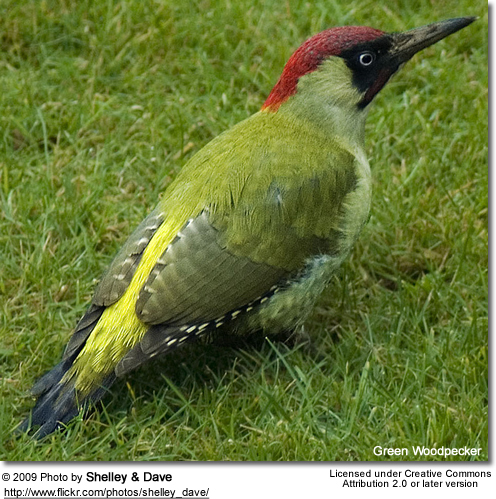 The crimson at the base of the bill is present in the young of both sexes, and their upper parts are barred, their underparts barred, streaked and spotted. Though a large and heavy bird it has an easy, bounding flight. It alights on a trunk or bough and works upwards with a diagonal or spiral course in quick jerky jumps or runs, halting occasionally with head drawn back and bill held at right angles to its body. As it proceeds it taps the bark smartly, probably sounding it for hollows made by its prey. Rarely, a bird will descend for a short distance, tail foremost. Insects are captured by a rapid outward flick of the long tongue, gummed to its tip by sticky saliva. 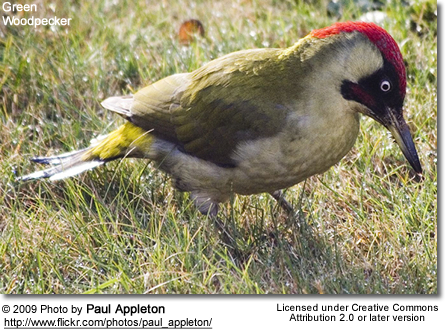 The food is similar to that of the spotted species, except that this bird has a passion for ants. It will attack large nests in the woods, throwing aside the piled pine needles with its bill and nipping up the insects with its tongue. When seeking ants it will wander to a distance from trees. From early in the year until summer the loud ringing plue, plue, plue is a typical woodland call, often described as a laugh, and from which the bird gets one of its names, "Yaffle". Folklore has associated this " song " with a threat of rain, and another name is " Rain bird," but weather has little to do with the bird's calls. Though it has been heard to "drum" upon wood, it certainly does not use this call so frequently as the spotted woodpeckers. The alarm note is the laugh emphasised and harshened. 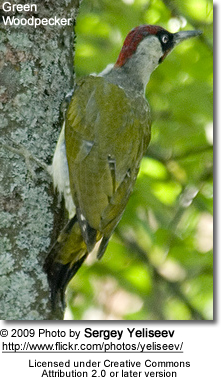 The nesting hole is larger but similar to those of the other woodpeckers. It may be a few feet above the ground or at the top of a tall tree. Five to seven glossy white eggs are laid upon wood chips late in April or early in May. There is only one brood.